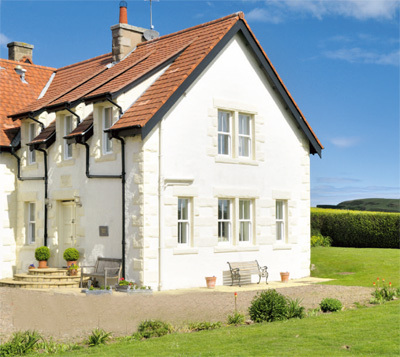 Tarras Moss is a semi-detached three-bedroom property overlooking the famous Coldingham Sands in Berwickshire. The house itself is a period building which has been completely restored and brought up-to-date. Accommodation in total comprises: reception hall, open plan kitchen/dining room, darwing room, three bedrooms and two bath/shower rooms plus a laundry room and a cloakroom. Outside are extensive communal grounds which are mostly laid to lawn and lie within the gated community. There are panoramic views of Coldingham sands from inside and outside the house. This is the centerpiece house of the re-developed St Abbs Haven, which was originally built in 1905 as alarge private house and is located at the end of a private road with direct access to the Blue-Flag beach. Coldingham itself is just one mile, while Berwick upon Tweed is 12 miles for further amenities. The guide price is £400,000. For further information please contact 01578 722 814 or visit www.knightfrank.co.uk.